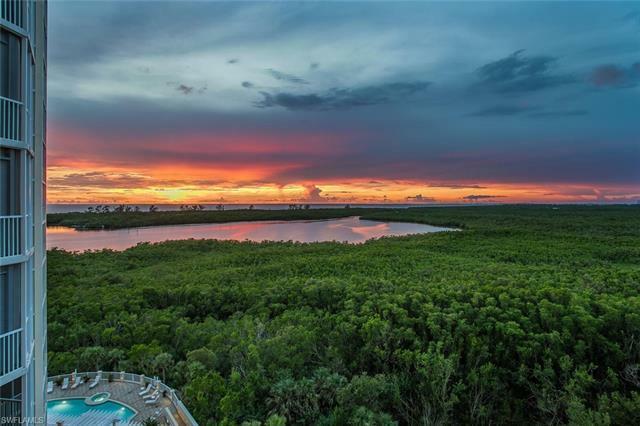 Enter this tastefully decorated 8th floor residence from your own private elevator and marvel at the gorgeous views and sunsets of Turkey Bay and the Gulf. Membership in the exclusive FLORIDIAN BEACH CLUB on Vanderbilt Beach is also available for transfer to a new owner! One of the most sought-after residences in the Grande Excelsior, this spacious, 3, 353 square feet, 3 BR, plus Den, 3 1/2 BA residence features a gourmet kitchen with gas cook top, granite counters, built-in oven, Advantium microwave, and wine cooler, and a spacious lanai to enjoy the incredible view. The Grande Excelsior features its own pool and spa, barbecue area, 2 underground parking spaces, private fitness room and Concierge Center. The Dunes amenities center is presently undergoing a dramatic, multi-million dollar renovation, which includes an elegant new indoor-outdoor restaurant, resort pool, tiki bar, fitness center and tennis facility. With scheduled completion in Spring 2019, these amenities will add even more value for Dunes owners and further enhance The Dunes reputation as The Premier Coastal Resort Community in Naples. The Dunes is PET FRIENDLY.